The best curries are made with the freshest of ingredients (including the spices) and cooked quick. That's why this cauliflower and chickpea curry is so, so excellent plus straightforward to make — a surefire winner. 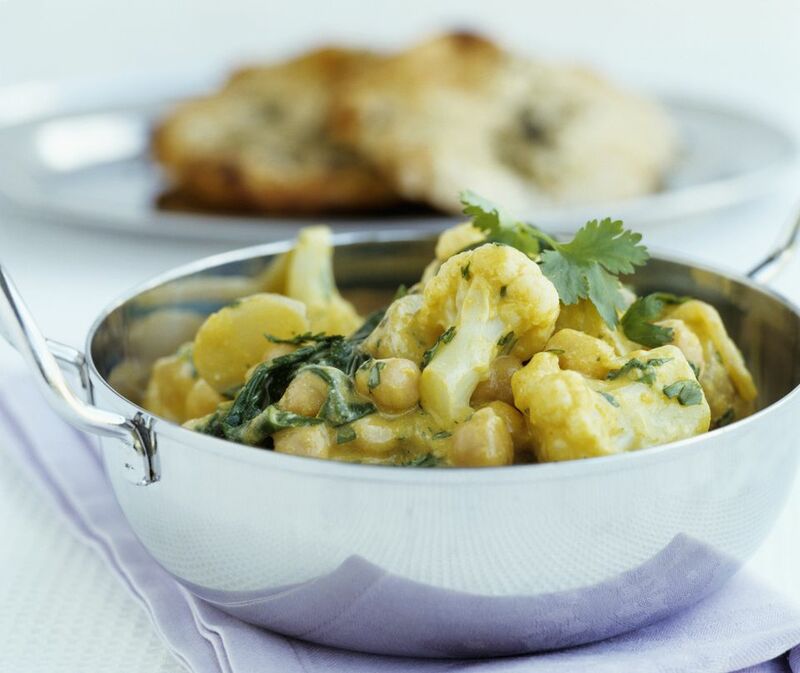 In this recipe, elevate the humble British cauliflower to new heights with this vegetarian Cauliflower and Chickpea Curry recipe. Not only is the curry recipe quick and easy to make, but it is inexpensive and nutritious. This makes the curry perfect for both the main meal, lunch or a side dish for meat - so suits vegetarians and carnivores alike. The secret to success with this dish is not to overcook it, especially the cauliflower. Heat the oil in a large frying pan, add the chopped onion and cook on medium heat until the onions are soft. Add the green chili, ginger, and garlic and continue to cook for 1 minute, taking care not to burn. Then, add the chili powder, turmeric, garam masala, and sugar and cook for a further minute stirring constantly. Pour in the tomatoes, chickpeas and coconut milk, stir well. Remove the outer leaves of the cauliflower, cut away the thick stem at the bottom, then break the cauliflower into florets roughly the same size — try not to make them too small or they will disintegrate, too big, and they won't cook. Add the cauliflower florets to the spicy sauce in the pan. Simmer for 10 minutes until the cauliflower is cooked through, but not soft. Add a little stock or water if the sauce gets too thick. Check the seasoning, and add salt and/or pepper as required, then stir through the spinach until it just starts to wilt. Serve with cooked rice, and/or Naan bread or chapattis. Fresh ingredients are best. Because this is a quick-cook curry, an overripe cauliflower will not work. Freshness extends to the spices as well; it is the habit of many to keep spice jars in the cupboard for years on end and expect them to be good; they aren't. Clear them out on a regular basis.